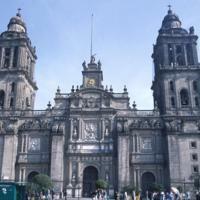 This is the main façade of the Cathedral of Mexico City. Although begun in the 16th century, the cathedral was not complete until the early 19th century. It was thus a building constantly under construction during the colonial period. Built over time, the façade of the cathedral reflects the tastes of different eras. Above the three doors are relief panels, carved from a lighter stone, and represent Assumption of the Virgin (center), St. James the Greater (left) and St. Andrew (right). All were sculpted by Miguel Ximénez in 1687. At the very top of the façade, above the clock are three sculptures made by Manuel Tolsá in 1813. They represent the three theological virtues. Below the clock is the national seal of Mexico whose iconography derives from 16th century Aztec pictorial histories. They depict the eagle perched atop a cactus as the sign from the deity Huitzilopochtli to found the city. The oldest bell still hanging in the towers dates from 1587, the most recent was installed in 2002, to commemorate the canonization of Mexico’s first saint, Juan Diego. Like so many of the main buildings in the center of Mexico City, the soft ground under the Cathedral has settled unevenly, and so too has the building. Reinforcement efforts, not only to stabilize the structure’s foundation but also to protect against earthquakes, have been undertaken numerous times in modern history, with a major engineering project recently completed. Built over the course of centuries, the Cathedral is an accretion of exterior styles and interior decorations. The weight of these has caused it to slowly sink into the ancient lake bed. During the colonial period, it was the official center of the Catholic Church in New Spain, where viceroys were welcomed and dead kings mourned. But for most residents of the city, local parish churches were the places of their primary affiliation, as well as the numerous shrines to local Virgins, including the Basilica of Guadalupe to the north. Ovando-Shelle, Efraín and Enrique Santoyo. 2001. 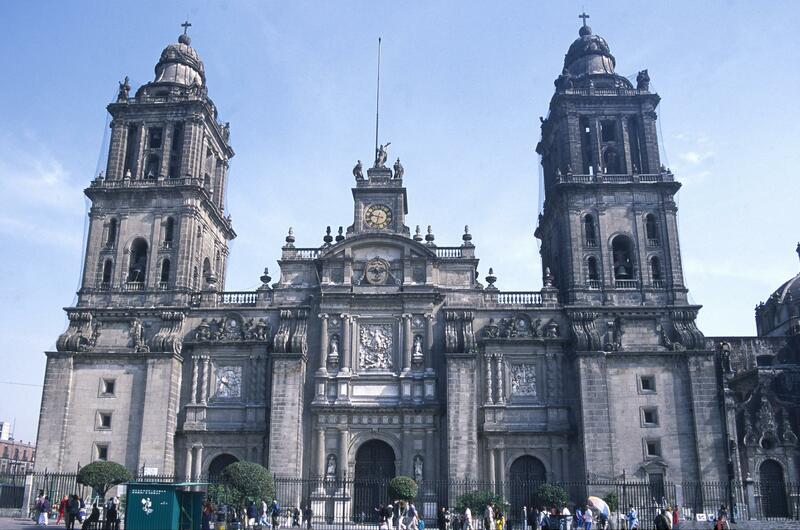 “Underexcavation for Leveling Buildings in Mexico City: Case of the Metropolitan Cathedral and the Sagrario Church.” Journal of Architectural Engineering 7 (3): 61-70.